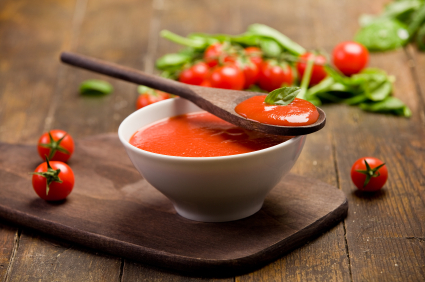 Home » Recipes » Homemade : Pasta Sauce! Posted on Jan 27, 06:15 PM in Main Course and Vegetarian. No comments. I haven’t forgotten my home made series ! Most families these days do seem to have a pasta night. Pasta meals go down well in my house. I like making pasta dishes for a few reasons – its quick and easy, relatively easy on the purse, most of the family seem to like it and I can pop lots of vegetables into pasta dishes. Most people can master their own version of the bolognaise but it’s such a shame to see people reach for the trusty old bottled sauce. Home-made? Well you could argue that a meal made with a bottled sauce isn’t. I’m not that pedantic but do wonder why people just fall into the trap of grabbing the,(often sugar laden and overpriced), bottled sauces from the supermarket shelves. I can’t fathom why we buy bottled pasta sauce when it’s so easy to make. And you can tinker with it as much as you like to make it just the right flavour for you and your family. Here are a few versions – using canned tomatoes or using tomatoes from fresh and in the slow cooker. Heat the oil in a large saucepan over medium heat. Add the garlic and onion and cook for 3-4 minutes until softened but not browned. Add the peeled tomatoes, reduce the heat and simmer for 8-10 minutes, until thickened. Stir through the salt and pepper, sugar, basil and parsley, adjusting the seasoning as required. Firstly you will need to remove the skins from the tomatoes. You can do this over a gas flame or using the boiling water method. This is when you cut out the core at the end of each tomato and make a small X on the spot where it was. Then you need to pop the tomatoes in groups in boiling water for a few seconds, until you see the X start to widen. When this happens, place the tomatoes in iced water and take them out and start peeling the skin away using where the cut of the X is, as a starting point. Once the tomatoes are peeled, place them in the slow cooker with the rest of the ingredients and cook on low for around 8-10 hrs. The beauty of these is that you can try your own thing – experiment with herbs, add olives, mushrooms, hot peppers…whatever you fancy.